You’re the biggest movie star in the world: Oscar-nommed, box-office gold, great smile. It’s been that way for decades. But for whatever reason (you’re shorter than Will Smith, they say you believe in aliens, yada yada), you need a popularity boost. What do you do? You play a Nazi. Obviously. The story is one of the most remarkable of World War Two. “This guy” is Adolf Hitler. In July 1944, less than a year before the war ended, German Colonel Claus von Stauffenberg attempted to assassinate the Fuhrer with a briefcase full of bombs. As Nazis go, you’d struggle to pick a better one. You could say the same for Valkyrie’s filmmaking team. After three back-to-back blockbusters and with his Superman Returns sequel stalling, Bryan Singer was looking for a smaller, gristlier project when Usual Suspects screenwriter Christopher McQuarrie showed him the pitch: an ensemble thriller just like their 1995 Oscar-winner. Along with the script, Singer and McQuarrie gave Cruise a picture of von Stauffenberg. On hunt for new projects for his newly rejuvenated studio United Artists, the actor/producer was hooked by both. McQuarrie’s screenplay – his first since The Way Of The Gun eight years ago – begins as von Stauffenberg returns home to Nazi Germany after being horribly wounded in Africa. It’s here he begins plan Operation Valkyrie, a plot to seize control of the German government after the Fuhrer’s death. After several failed attempts to kill Hitler, Stauffenberg decides to do the job himself. “The screenplay itself is extraordinary,” says Cruise. “It made my hands sweat when I was reading it. This movie, you must understand, is not a biopic. It’s not a documentary. It’s a thriller – very dynamic, very tense.” None of that stopped Cruise from immersing himself into the history of the character. “When I started out, I was like, ‘Okay, let me do my own research.’ I spent…” he pauses. “What month are we?” It’s August. “It’s been eight months of preparation for me.” Cruise hired his own personal researcher, studied history books and spoke with the surviving members of von Stauffenberg’s family. There’s one thing, mind. Cruise’s von Stauffenberg doesn’t sound particularly German. “You know, we spent a lot of time going back and forth over that,” says Cruise, inviting us to take a seat with him as we duck inside a small screening room. “All of a sudden you’re listening to people trying to put on accents and Bryan finally said, ‘No, no, no.’ Just tell the story. 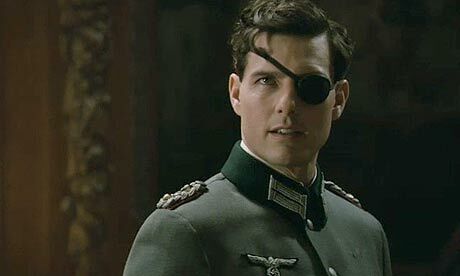 We don’t want to do an accent movie, just try and find something neutral that won’t distract from the story and the characters.” On a physical level, though, Cruise has plenty to grab on to: Stauffenberg lost his left eye, his right hand and the fourth and fifth fingers of his left hand when his vehicle was strafed by British fighter-bombers in Africa. Donning an eye patch and learning to write left-handed, the German joked that he never really knew what to do with so many fingers anyway. “I actually practised a lot of dressing myself, moving around and writing, only using the fingers and not having a hand,” says Cruise. Total Film looks down at his left mitt. What was it, two fingers? “No, I’ve got three,” he laughs, waggling his digits before using one of them to prod the play button on the videoscreen in front of us. Luckily, Cruise wasn’t the only one who saw the bigger picture. Von Stauffenberg’s grandson took a role in the film, while several German newspapers, Das Boot helmer Wolfgang Peterson as well as The Lives Of Others director Florian Henckel von Donnersmarck and star Armin Mueller-Stahl all gave their support. The tide began to turn. Having read McQuarrie’s script, the Defense Ministry relented. Still, as filming started in summer 2007 – almost on the exact anniversary of the failed assassination – they had reason to be cautious. For the first time since Hitler’s reign, swastikas appeared across filming locations in Berlin and on sides of World War II planes that flew above Brandenburg. Passersby were shocked. But authenticity was what Singer and Cruise wanted. The crew even procured surviving Nazi relics, everything from tables and chairs used by the Reich Ministry to items that once sat on Hitler’s desk. Stauffenberg was caught and shot dead a day later. Before filming the scene, Cruise led a moment of silence. But disaster almost struck: the film was ruined in development, meaning Singer had to beg the German government again for permission to reshoot at the Bendlerblock memorial site. But by this point, it was unclear when audiences would see any of the film. Originally slated for release in August 2008, Valkyrie was dragged forward to June, then shoved back to October. The thinking? To dodge blockbusters WALL-E and Wanted, to allow Singer to shoot the major battle sequence in which von Stauffenberg loses his eye and hand and to boost Valkyrie’s odds of Oscar glory. But when the film was shunted back again to February 2009 with the budget swollen to a reported $100 million, bad buzz was starting to rumble. But Tom Cruise is smart. By the time anyone sees him as a one-eyed Nazi assassin, they’ll have seen him in hairy-armed fat-suit, a bald-cap, swearing violently down a cellphone in the year’s most hilarious comedy performance. Here’s the heads-up: Ben Stiller’s all-star comedy Tropic Thunder is Cruise’s other war movie – and he’s the best thing in it.